H1Z1‘s reign as the only vehicle-based battle royale game didn’t last long. Crossout is getting into the mix now, with a 32-person winner-take-all mode in its latest update — and it’s not an April Fools’ joke. 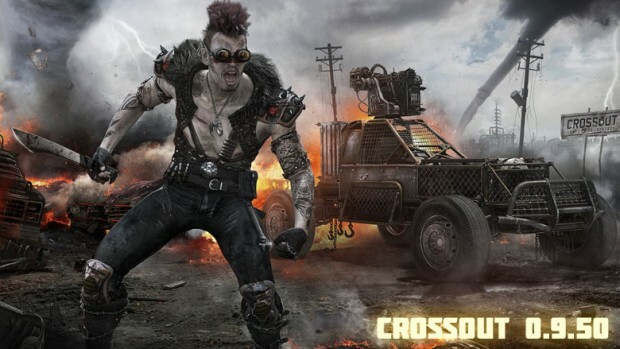 Crossout Royale offers all of the usual elements you’ve come to expect in a BR mode. You start with a basic vehicle with one light weapon and have to drive around the battlefield, picking up new weapons, modules, and structural parts, which you can quickly and easily install on your vehicle. Special cargo drops appear at regular intervals to tempt players, and an encroaching dust storm eventually shrinks the playable area, consuming any unfortunate vehicles that happen to be caught up in it. So yeah, that’s pretty much your basic battle royale gameplay. Learn more about Crossout Royale and the new map in patch 0.9.50, Blood Rocks, on the Crossout site.